The family will need a new table to put the tv on. The table won't work so a different one will be moved in from another room. Once the table is in place, the mom - that's me - won't like how the couch is lined up in the room. The mom will move the couch to better fill the space. The space is better filled now but there are empty areas that need book shelves. The mom brings shelves in from another room. The shelves are in place and neatly arranged with books and old cameras but the mom notices that the computer area is too close to the couch and shelves. The computer area MUST be moved! The mom disassembles the computer, moves the desk and realizes she now needs two desks instead of one. Another desk is brought into the room from another area in house and all seems well - but it's not. The desks need something. Something to tie them both together and to make a bigger work space. so it goes...the area with the new tv looks great but everything else, including several other rooms and areas are now bare and in need of being rearranged and redecorated. Not to mention that my computer, the one I use to blog and edit photos is still disassembled, on the floor, in pieces. It's waiting for it's new home to be built. My husband calls this, lovingly of course, the perpetual state of optimization. I'm now in the process of relocating half of my craft and jewelry making supplies, building a computer zone and baking chocolate chip cookies while I try to stay sane in the midst of all the transitions. And all of this happened just because we bought a tv! Cute post, Amy! Good luck with making room for everything! 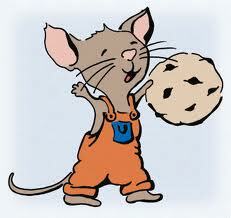 My daughter and I attended a baby shower a couple of weeks ago and she gave that book (mouse/cookie) as her gift. One of the ladies at the shower mentioned wanting to write a book called, "When you give a mom a glass of wine..." We thought that was pretty funny, but probably wouldn't have as pleasant an ending as your TV bit! Oh my gosh! A similar situation is happening at our right now. I decided that I was going to move my dresser into the kitchen to use as storage for baking items. However, it's created a chain effect. In order to move the dresser, I need a new dresser (well, we'll finally get matching dressers) and the new dresser will be deeper than the existing which will not fit because the sleigh bed frame sticks out too far; so now I need a new bed frame, but need to get rid of the old first. All this is to save having to buy a storage solution for the kitchen. I'm going to have to look up this book...it's so very true! I love this. It's too funny and too close to home, lol. -Susan F.
This made me laugh a lot! It reminds me of the Flanders and Swan song ''Twas on a Monday Morning'. If you haven't heard it, look on U tube, it's bound to be there. I do hope you get sorted eventually! We went a few years without a TV when our girls were younger (probably around 3rd and 4th grades) because their Dad was obsessed with it and had it on constantly ... so it went to the attic. My daughter, now 26, says it was one of the best things we ever did! It turned her into an avid reader ... and she even got me interested in reading which I never really enjoyed before that!